Much of this increase occurred among older teens ages 14-17, who went from a median of 6 texts a day to a median of 100 two years later. 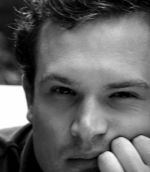 Boys of all ages also increased their texting volume from a median of 30 texts daily in 2009 to 50 texts in 2011. Black teens showed anincrease of a median of 60 texts per day to 80. 63% of all teens say they exchange text messages every day with people in their lives. This far surpasses the frequency with which they pick other forms of daily communication, including phone calling by cell phone (39% do that with others every day), face-to-face socializing outside of school (35%), social network site messaging (29%), instant messaging (22%), talking on landlines (19%) and emailing (6%). At the same time, teens’ phone conversations with friends are slipping in frequency. 14% of all teens say they talk daily with friends on a landline, down from 30% who said so in 2009. Nearly a third (31%) of teens say they never talk on a landline with friends (or report that they cannot do so). 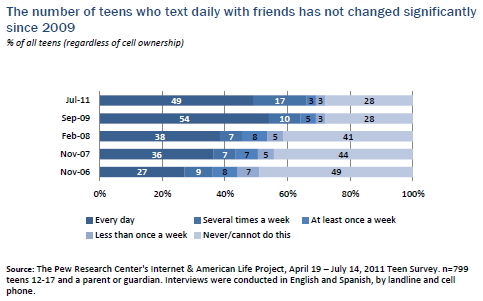 26% of all teens (including those with and without cell phones) say they talk daily with friends on their cell phone, down from 38% of teens in 2009. And what about the smartphone usage and ownership among teens in the US? Some 23% of all those ages 12-17 say they have a smartphone and ownership is highest among older teens: 31% of those ages 14-17 have a smartphone, compared with just 8% of youth ages 12-13. There are no differences in ownership of smartphones versus regular cell phones by race, ethnicity, or income. Teens whose parents have a college education are slightly more likely than teens whose parents have a high school diploma or less to have a smartphone (26% vs. 19%).